A lot of people new to the electric and plug-in hybrid car world are worried about how they will charge their vehicle. However this is very easy nowadays with the capability to charge, from your own home to superchargers, and other charging facilities across the UK. 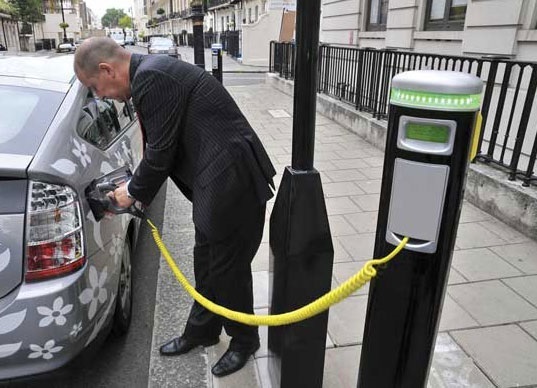 By 2020 the European Union has said that the UK must have a minimum of 60,000 electric car charging points, bearing in mind that this is only five years away we feel that you will be in safe hands to charge your car at any time no matter where you live in the UK in 2015. Home chargers can be placed on one of your outside walls, on a shed or in your garage. The government are still offering a 75% subsidy to the cost of this, providing you own or lease an electric car, for more details follow government home charging scheme. Charging station are available across the UK road network, in supermarkets, at supercharging stations from Tesla, fire stations, other government locations to park-and-ride's, airports and anywhere else that can fit one. We have a detailed charging map available to provide you the nearest location of an EV charging point. There are also a number of charging schemes, where becoming a member allows you to use a network of UK wide charging points. We have details of the different types of charging schemes for you. Different chargers and different vehicles use a variety of charging leads, we have provided details of these charging leads, as well as a how to guide for charging EV’s and HEV’s. There are also various types of chargers, and these chargers are dependent on the power unit. A typical full charge can take anything from 30 minutes to 8 hours; however the average time to charge a pure electric car like the Nissan Leaf, from a typical 16a supply is around 8 hours, however a 32a charger can reduce this time from between 4 to 6 hours. If you travel less than 100 miles a day and you sleep for four to eight hours a night, then you can have a fully charged car without ever having to go to a petrol station again, and wasting time and money at the pump. The average commuter in the UK only travels a maximum of 40 miles per day, well within the range of an electric vehicle. Being stranded on the road, is one of the contributing factors to range anxiety, however this is very unlikely to happen. With a plug-in hybrid it is much the same, however, you can obviously travel a lot more than 100 miles a day, in fact you could travel up to 1000 without the need to refuel, as these vehicles are not dependent on being plugged in to a power unit. As they use a combination of petrol or diesel. With electric vehicles such as the BMW i3 the cost to travel 25 miles is as low as 25 pence. That is an amazing 1 pence per mile. A typical electric car will only cost around £2 to £3 to charge for a 70 to 80 mile range. Now that can be a saving of over £20 compared to a conventional combustion engine, and if you drove that distance daily you are looking at over £7000 saved in a year *. Follow this link if you are interested in finding out about other fuel types for modern vehicles. * All cost and savings calculations are estimates, based on average consumption, utility and fuel prices. Prices will vary depending on vehicles.